Hi! A big thank you for landing here. I don’t blog often; when I do, it feels great that someone else took out time to read it and hopefully take away a few things from it as well. If you know me already, you might have read Part 1 and 2 of my journey. If not, take out a few more minutes and read them first. You will be able to connect the dots much better, I promise! From the work I did with Prof. Kristina Lerman at University of Southern California in summer 2015, we ended up writing a research paper. After many hours put in, more than a dozen skype calls and half a dozen blacked out draft reviews from PK, as I sat down with a copy of my first paper, I was pleased. It was due for submission to a big conference. A month and a half later, I sat down heart-broken with my first paper rejection. I had no clue how acceptances at these conferences work out. Pillars (that’s what we call the Ph.D. students at the Precog lab and the metaphor couldn’t be more appropriate) told me it was a close miss. For me, it was as if a part of my world crashed (yes, I can be that dramatic!). After incorporating some suggestions from the reviewers, we sent it to ICWSM 2016, another great conference (source: Pillars). This time, I decided to be less hopeful and stopped thinking about it. I remember having difficulty sleeping the night before the result was due. The paper got accepted. After a few congratulatory messages and phone calls, I realized that brooding over the previous rejection was an absolute waste of time. I have such revelations when I am extremely sad or happy. The most I had learned from this phase was when I was doing the analysis, which the paper was based on. The acceptance was just going to be a line in Font 12 on my resume and an end to the journey of working on my first paper. That’s about it! But life had something else in store for me. Kristina wrote to me that she cannot make it to Cologne, Germany, where ICWSM 2016 was going to be held. David, one of the co-authors, was going for the conference and I thought he would present our paper. After a few weeks, I found out – PK is going to attend the conference and so am I. From that moment began the journey of my first paper presentation. I had never attended one. So I was miles away from knowing what a good paper presentation is like. I got a few slide decks for reference from the Pillars and after a few iterations on my deck, it was time for my first practice talk in the Precog lab. Now, these adorable people in the lab have the potential to thrash you in and out if your work doesn’t meet the ‘Precog’ standard. They DID NOT like my presentation, and that’s me putting it politely. PK was going to join in the next practice talk from Germany over Skype (yes, he always goes the extra mile for his students). I had worked on the suggestions that came after the first practice talk. However, I still felt a little clueless and the reviews I got reflected that I was nowhere close to the mark. I am not that bad with presentations but presenting a paper is not the same. This time, I was upset. Determined to deliver a good presentation, I boarded my flight to Cologne. 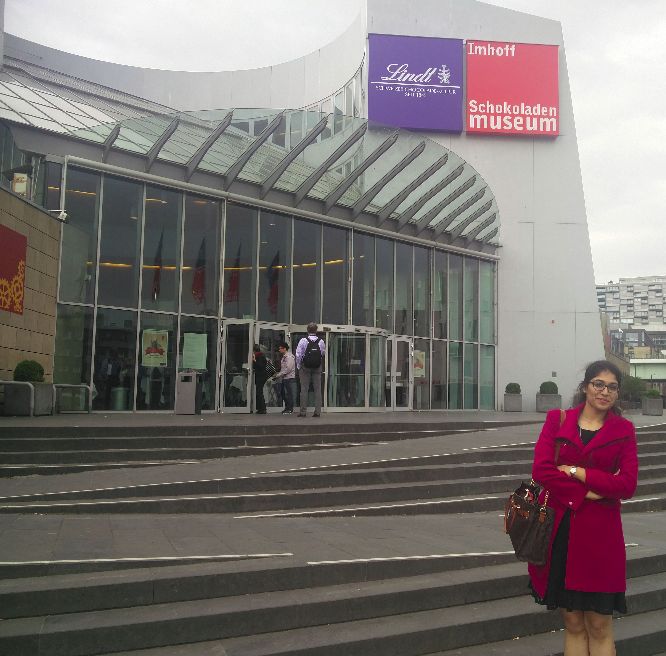 I reached Cologne a few days early as I had planned to explore the city before the conference. PK was going to come in another 2 days. I spent time listening to recorded versions of my presentation and practicing with my friends over Skype and Hangout. 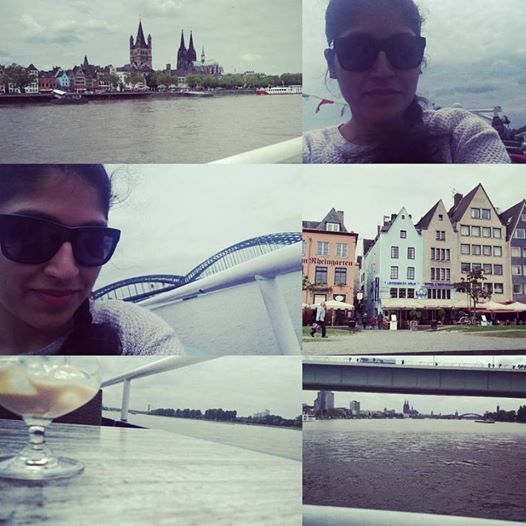 I did take occasional breaks to cruise off the coast of river Rhine, try some German delicacies and explore the Roman cathedrals all over the city. Europe is as beautiful as they say it is! 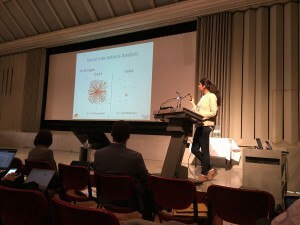 I also attended the ICWSM slam, which was organized by David. ICWSM is the only conference that has this sort of a creative event. 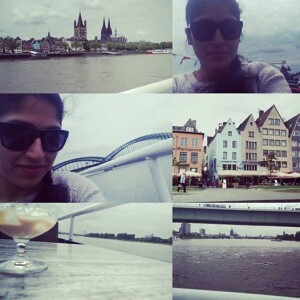 Cruising off the coast of river Rhine..
PK arrived on the morning of 18th May, the first day of the conference. I was looking forward to it as I wanted to take away a few things for my presentation, which was scheduled on 19th afternoon. I asked PK to rate each presentation on a scale of 10 so that I could differentiate between good presentations and the ones that were very good. I spent most of my time diligently making notes that could benefit our work at Precog. Another discovery that day made me uncomfortable. 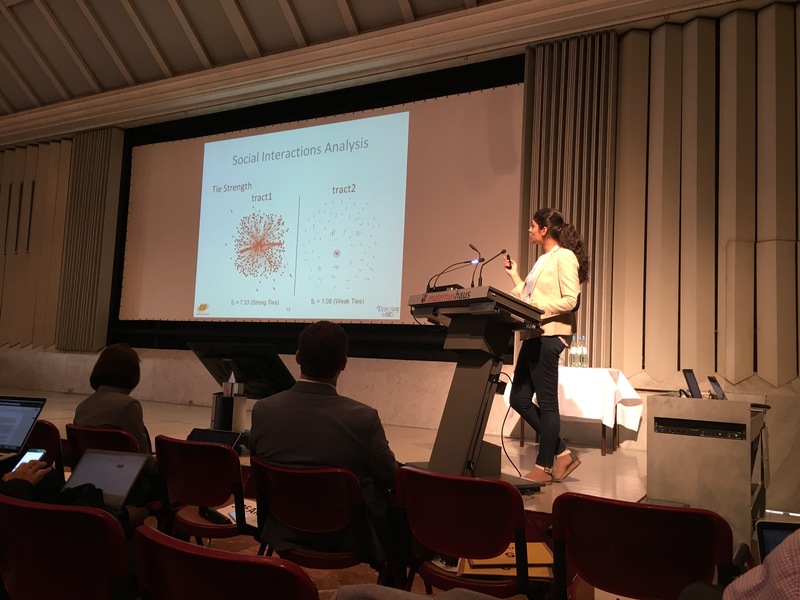 I was one of the only two undergrads at ICWSM who were there to present. The other one was from Stanford. I should have felt accomplished belonging to this minute fraction of attendees, but it only made me more nervous. The evening reception for ICWSM was in the Chocolate Museum (isn’t ICWSM the best conference ever?). I had – fun and intellectual conversations, a couple of drinks, and a lot of chocolate. It was time for my final practice talk with PK. He was ready with a notepad and I didn’t feel nervous at all. The list of suggestions was much smaller this time and he felt I had improved considerably. I couldn’t be more glad, or it would have been another sleepless night with my slide deck. 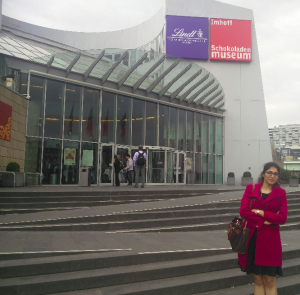 In front of the Chocolate Museum. It was the day of my presentation. I could feel my stomach rumbling. Breakfast was difficult to swallow. I was sitting in the presentation room, but mentally I was in the Precog lab and my practice talk wasn’t going well…. It was the coffee break before my slot and I went to check if the laptop and the presenter were working smoothly. It was 11:20, 2 spotlights on my face, my slide deck on the projector and in the audience, people who did this for a living (told you I can be dramatic!). 14 minutes later, I was asked two questions. I answered, came downstairs, went to PK and asked – “How much on a scale of 10?”. The number he typed on his phone was way beyond my expectation. I couldn’t talk much then but I knew two things. I didn’t mess it up and PK was just trying to make me feel better as he had gauged how nervous I was. In the lunch session, everyone I talked to started the conversation saying – “Good/Great talk!” I ignored it thinking that researchers are way too polite anyway. It slowly started sinking in that my presentation went well. Someone told PK that they haven’t even seen Ph.D.’s deliver presentations with such confidence (something along those lines…). The hashtag I use to describe such moments is #happinessUnbound. That evening I spent some quality time with PK. I didn’t know when I was going to meet him again (oh yeah, I missed that detail!). I have completed 4 years of my B.Tech. at IIIT-Delhi and am headed to Carnegie Mellon for an MS in Computer Science. 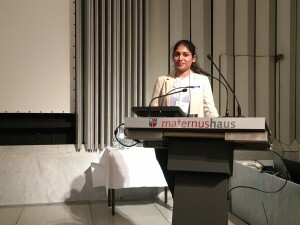 My take away from my first paper and presenting it – ‘If you only do what you can do, you will never be better than what you are.’ :’) It has been 4 wonderful years working as a Precog-er. There is a lot I can write, but words cannot do justice to describe this time. I am still going to try to sum all of it up in my next blog. Stay tuned! PS: Link to the paper and slide deck.